This had to be the largest eruption of applause in the history of high school interim principal announcements. DALLAS – It was a roller coaster of emotion Wednesday morning in the auditorium of Dallas ISD’s Booker T. Washington High School. An assembly at the school started with a beautifully-executed “announcement” from principal Scott Rhudes that he was stepping down from his post – bombshell news that was met with gasps and confusion among the hundreds of students watching on. What came next was likely the largest eruption of applause in the history of high school interim principal announcements. Naturally, Hart’s address included some jokes. For instance, a promise of a noon start time for class, and an all-chicken-nuggets lunch menu. But Hart, along with producer Will Packer, delivered an inspiring speech about ambition and drive to accomplish goals. Watch his speech below or here. The stop at Booker T. Washington, a school for fine arts, was part of a nationwide tour promoting Hart’s new movie, Night School. In the film, Hart’s character is a successful salesman despite being a high school dropout. He needs a high school diploma, though, to get get a job as a stock broker. He and a cast of other troublemakers attend night school in hopes of passing the GED exam, according to IMDB. Hart and Packer have visited several schools promoting the movie. On Tuesday, they donated $12,500 to an Atlanta high school as part of the tour. He's sitting down for an exclusive one-on-one interview with WFAA's Good Morning Texas Wednesday. 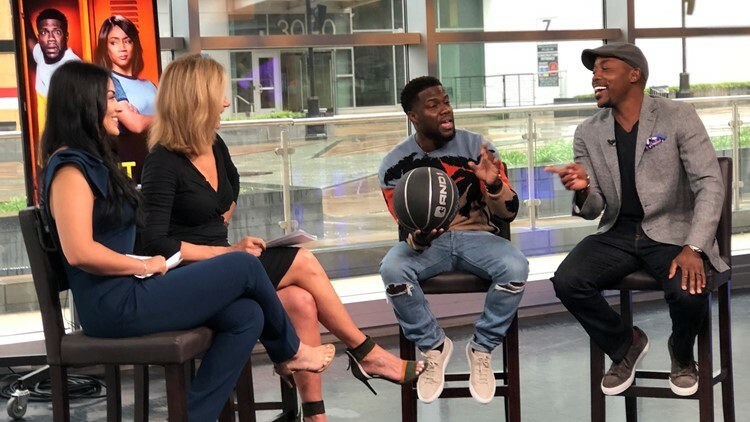 Kevin Hart sits down with WFAA's Good Morning Texas. Note: If the quotation marks earlier in this write-up didn’t properly convey the in-jest nature of Rhudes’ announcement – he is not *actually* stepping down as Booker T. Washington’s principal.